Punching bread dough down after it rises is a tried-and-true method of degassing the dough (removing any air bubbles) and reinvigorating the yeast cells, introducing them to the new food. But folding the dough is also a valid technique for executing these tasks. 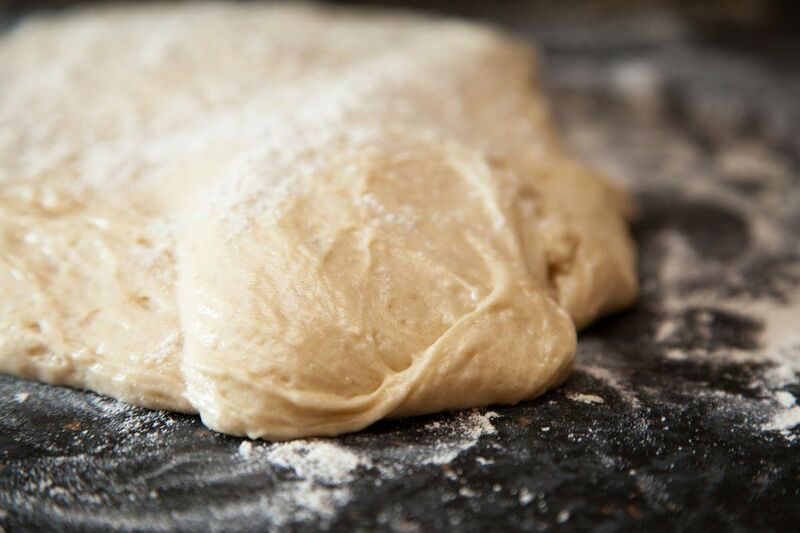 When you fold the dough, you do three things: expel the carbon dioxide formed during fermentation, strengthen the dough by aligning and stretching the gluten strands, and equalize the dough's temperature which eliminates hot spots. Punching down and folding affect the dough's texture in different ways. Punching down will result in a finer, more tender crumb—something you would look for in a sandwich bread or pastries like cinnamon rolls. The folding method creates a bread that rises higher and has a looser crumb and air pockets once it is baked. This is a welcome characteristic of artisan bread, baguettes, and dinner rolls. Some recipes that call for folding are oatmeal bread and Landbrot, a sourdough wheat bread. But feel free to try folding in recipes that call for punching down the dough. During bulk fermentation (the first rise), your recipe may instruct you to punch down the dough at regular intervals. Instead of punching it down in the bowl, turn it out on a floured surface (use enough flour so the dough does not stick to the board). Pat the dough down, removing most but not all of the air bubbles. To create the first fold, pick up one of the sides of the dough (on the right or the left) and fold it a third of the way over the rest of the dough. Brush off any excess flour. The second fold is like folding a letter. Pick up the opposite side of the dough that you folded and stretch it over the first fold, laying it on top. Brush off the extra flour. To make the third fold, grab the top edge of the rectangle (the side farthest from you) and pull in toward you, folding it ​one-third of the way. On all of these folds, gentle stretching is ideal and the dough should not be pinched closed in any way. You should be able to see the layers of the folds. Now it is time for the final fold. Fold the piece of dough closest to you (the bottom edge) over the other folds which will now create a square. Brush off the excess flour. Place the dough back in the bowl. If the recipe calls for using a floured or oiled bowl to keep the dough from sticking, be sure to do this before placing the dough in the bowl.